NY Tempered glass is often used in applications where using standard glass could pose a potential danger. Tempered glass is stronger than standard glass and does not shatter into large shards when broken, this is important because it can greatly minimize potential danger in the case of a break. Manufactured through a process of extreme heating and rapid cooling, tempered glass is much harder than normal glass. 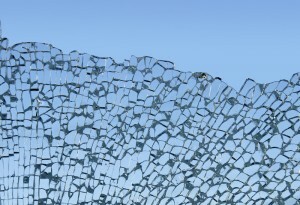 In the case that tempered glass does break, it shatters into small pebbles that are void of dangerous, sharp edges. As tempered glass is considered to be much safer than normal glass, you may often here it referred to as safety glass or toughened glass. Tempered glass has a wide variety of uses and you’ll find in just about everywhere. In fact, the shower doors in your bathroom or the side glass on a motor vehicle are examples of tempered glass. Another benefit of tempered glass is the ability to stand up to moderate heat (470°F). The process that creates this strengthened glass also makes it heat-resistant. This makes tempered glass a great solution for a situation where there is a danger of the glass breaking due to impact or moderate heat. Tempered glass is often used for fireplace doors (not woodstoves), on masonry and prefabricated fireplaces equipped with a grate to hold the burning wood. If tempered glass is exposed to higher temperatures, it gradually weakens the structure of the glass thus making it more susceptible to breakage. We temper glass right here in our facility Located in Brooklyn NY. That means we can craft the glass to your exact specifications, drill and edge, and make all necessary customization to make it the perfect fit for you project, whether it’s tempered glass meant to replace fireplace door or custom tempered glass shelves. Then we heat treat it in our unique vertical tempering furnace and ship it to you. If you’re not sure whether or not your project or item should involve tempered or another kind of glass, feel free to contact us and we’ll walk you through some of the ins and outs regarding applicability, pricing, availability, et cetera. We’re Custom Cut Glass, and our desire is to help you get the right piece of glass, at the right price, and right on time. 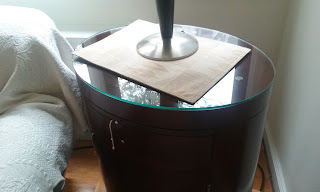 If you need a unique looking glass table tops, then we are the right choice for you.